"Ears: Set at the highest points of the sides of the skull, the ears are customarily cropped, cut rather long and tapering, and raised when alert. If uncropped, the ears should be of moderate size, thin, lying flat and close to the cheeks in repose, but falling forward with a definite crease when alert." Ear cropping is a very personal decision. For those who plan to show in performance or have a boxer strictly as a pet, natural ears are certainly acceptable. I have only had one boxer with natural ears, and we didn't really have the ear infections that some describe as being more common. If you wish to show in conformation, consider that natural ears are acceptable, but that judges these days still seem to prefer cropped ears. You will be in the minority if you decide to show an uncropped boxer in the conformation ring. However, I strongly support the natural eared boxer for many reasons, one of the biggest being something that most people aren't aware of. In traditional Chinese medicine, there are many sensitive acupuncture and acupressure points in the ears, and cropping cuts some of these away. And although the "energy signature" of those points still exists, the animal can no longer experience the physical pleasure of the massage of a natural ear with all its associated benefits. Obviously, there is expense and surgery risk associated with ear crops as well. The typical ear crop performed by an experienced show cropping surgeon is anywhere from $500 to around $800. I've had boxers for nearly four decades and my undergrad studies are in pre-vet sciences. I have worked in vets' offices and assisted with/observed many ear crops over the years. 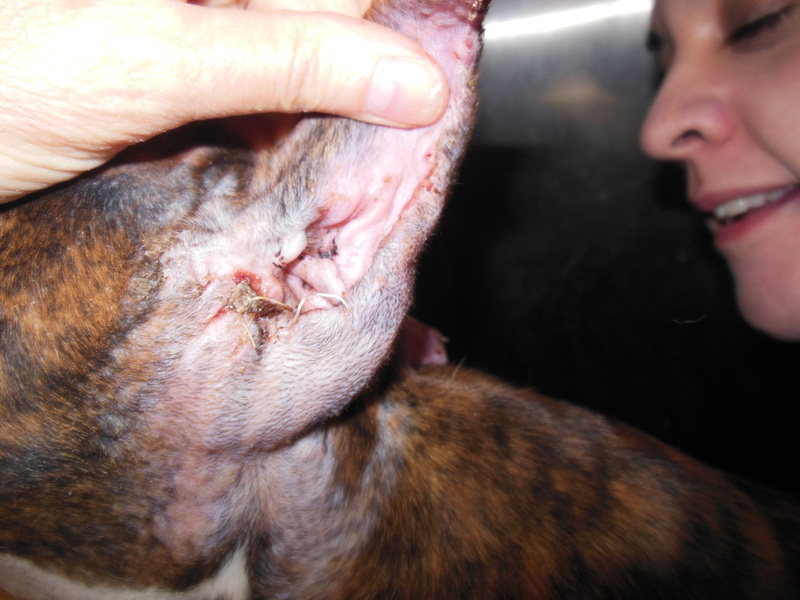 Be aware that ear cropping is an elective, cosmetic procedure that is not taught in veterinary school. A good ear crop surgeon has to learn on the job, and learns best from a mentor who has decades of experience. 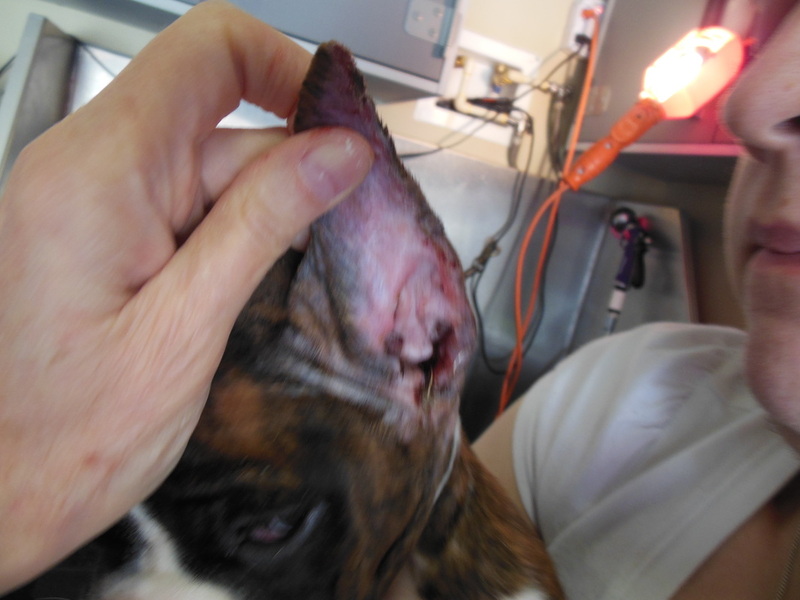 If you're going to have your dog's ears cropped, DO NOT go to a surgeon who is not recommended by local show breeders unless you are prepared to have a pet crop. A good ear crop is long, elegant, has minimal bell, and has an artful but subtle curve in the edge. A pet crop is typically short and has a wide bell so that the ear stands with minimal aftercare. However, if you're going to go to the expense and trouble of an ear crop, why not use a surgeon who can give you a beautiful result even if the aftercare takes longer? Also, DO NOT allow the surgeon to use Ace Promazine as a pre-anesthetic on a boxer. There are documented and researched dangers with Ace and it should never be used on boxers. Aftercare/posting can last from a few weeks to a few months, depending on the quality of the ear and the quality of the aftercare. I've used nearly every method imaginable to post ears, including popsicle sticks, snore-strips, Skin-Bond, mole-foam, and even tampon applicators. In my personal experience, I've found that using foam rods is the easiest on the dog and has the least risk. That is what is inside this puppy's ears. They are flexible, inexpensive, and easy to work with. Of all the methods, it seems to bother the dogs the least. The one thing I've found through experience is that using homeopathic and natural support speeds healing to nearly half the time and gives a cleaner healed edge. Homeopathy has virtually no side effects. Natural remedies such as Healing Solution are safe, very effective, and do not cause resistant bacterial strains to occur. I used to support my dogs with some type of antibiotic like Clavamox or Keflex, plus Rimadyl and Tramadol. I now use Healing Solution, Arnica and Hepar. The greater speed of healing and level of pain reduction is evident with natural supports. In my nearly four decades of working with ear crop aftercare, I've honestly never seen the kind of healing and effective pain support with traditional medication that I'm experiencing with natural medications - not just in ear crops, but in tail dock/dewclaw aftercare, wound care, allergic reactions, trauma, and a HUGE variety of health concerns - both in dogs and humans. It is not my intention to show how to do aftercare taping since there is an amazing site already available by Cheryl Cates (boxer breeder and professional handler) with great instructions on how to tape cropped ears at all stages. 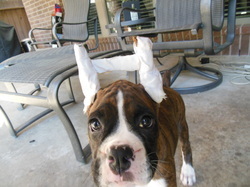 Raevon Boxers also has a great site for taping instructions to help a natural ear to fold beautifully.Please refer to these links for help, and contact local breeders for suggestions on surgeons for your geographic area. The pdf file below was written by Jennifer Tellier of Telstar Boxers and has a fantastic method of doing aftercare as well. Although I recommend Healing Solution for aftercare and wound support, and have had amazing results with this product, Dr. Dobias has made it clear that he does not support the cosmetic alteration of animal bodies. He allows me to provide Healing Solution in the Tail Docking/Dewclaw Removal Kit and for ear crop aftercare because it promotes healing in a way that traditional sprays and ointments cannot match. However, inclusion of Healing Solution in my recommendations in no way reflects his support of these procedures.